Using MotiFIT for heart rate zone training has many benefits. It helps optimize your trainning for specific goals like weight loss and high intensity interval training (HIIT). It even helps prevent over training. EKG heart rate monitoring (HRM) technology has been available since the 1970's. The problem is that HRM chest straps are generaly only employed by a very limited group of people. The arrival of the Apple Watch with a built-in heart rate monitor was the main catalyst that motivated Sylvio LeBlanc to create MotiFIT. Bringing a heart rate monitor to people's wrist greatly improves access to HRM technolgy. Starting with watchOS 2, MotiFIT is able to use the Apple Watch heart rate monitor to help users precisely track their workout performance. That's what MotiFIT is all about. Train Smarter, Get Exceptional Results! We already know that MotiFIT works great with bluetooth heart rate monitors like the Polar H7, the Wahoo TICKR and the Scosche Rhythm+. 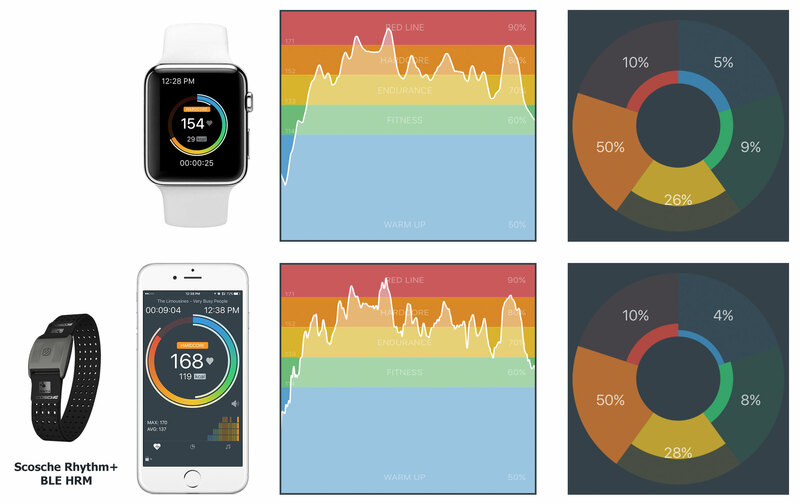 Now, how well does MotiFIT perform on Apple Watch using the Apple Watch heart rate monitor? Based on the sample workout below, judge for yourself. As you can see, MotiFIT on Apple Watch followed the same heart rate variations as MotiFIT on iPhone. Since the Apple Watch only samples the heart rate every 5 seconds, the bluetooth heart rate monitor was more precise. If you require that very high level of precision, the Apple Watch might not be able to replace your bluetooth HRM. Nonetheless, if you are simply looking to know your workout metrics (active calories burned, average / max heart rates, time spent in each heart rate zone) MotiFIT on Apple Watch is definately a great option.